Academic Technology Launchpad: Office 365 - Free! 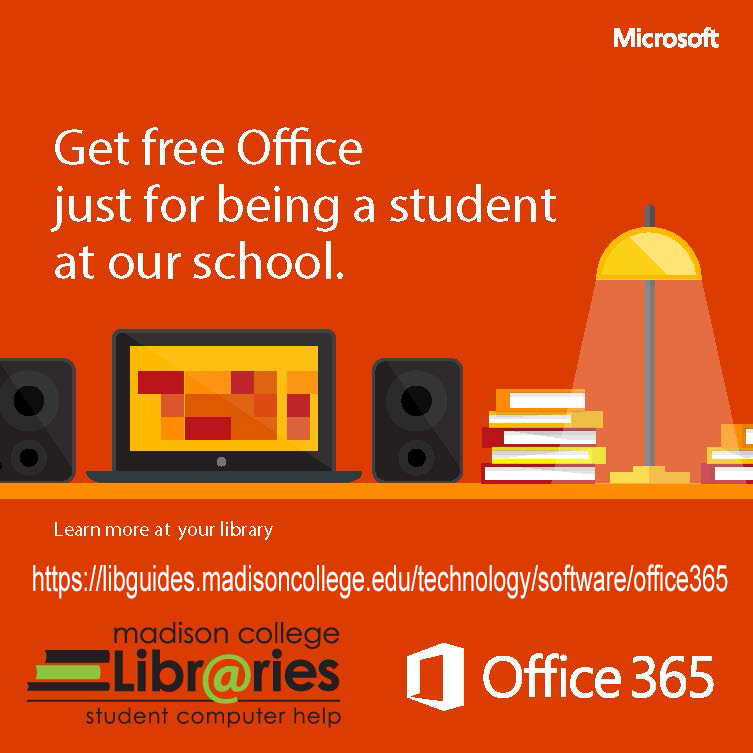 Microsoft Office 365 - for current Madison College students, faculty and staff at no cost through our college agreement with Microsoft. Microsoft Office programs for FREE! Full versions of software including Word, PowerPoint, Excel, and more. Packaged together for faster download and installation. Install on up to 5 of your personal computers and devices. Stays up to date with the latest releases from Microsoft. When you graduate or are not taking classes, your Office 365 subscription will end and you will no longer be able to use the software for free. Your saved files will still be available. Campus computers and virtual desktops have Microsoft Office already installed. Uninstalling previous versions is recommended by Microsoft. Be sure you have your reinstall media or information for the previous version in case you ever want to reinstall it. This college Office 365 is only valid while you are a student at MATC. Is your computer compatible with Office 365? How To Install Office 365 - PC (Windows) - Free! Latest version apps - currently 2016. Word, Excel, PowerPoint, OneNote, Access, Publisher, Outlook, and more. Login to your Madison College student email account. Click Office 365 - the link at the upper left of your screen; Click Install Office Apps (upper right). OR click the Gear icon on the right - select Office 365 under App Settings; then click Install Status. OR with New Outlook option Feb 2019: click the Office apps icon (9 squares) in the upper left corner, then choose Office 365. Choose Install Office and follow the on screen instructions, generally choosing the default settings. If a popup box appears at the bottom of the screen asking if you want to run or save the setup program for office, ​select Run. If a User account control box appears, allow access by selecting Yes so the install can continue. The Office logo may appear. It may take several seconds to load information, then a Welcome screen will appear. Select Next. You may see a window at the bottom of your screen that says "Office is installing in the background" along with a the percent complete. Do not turn off your computer or disconnect it from the Internet until installation has completed. If prompted, select either Use recommended settings or No thanks. Select Accept to agree to the Microsoft license and select Next as needed to proceed. Select Sign In and Enter your Madison College email address and your Madison College password. Be sure to select "Organizational Account" or "Institutional Account" when prompted. Do Not select Microsoft Account. When the confirmation message appears, your Office install is complete. Select done to exit the install. You can now use Office applications. How to find your Office apps in Windows 10, Windows 8, or Windows 7? Microsoft recommends that you uninstall any previous existing version of Microsoft Office software on your computer before installing a new version. Be sure you have your reinstall media or information for the previous version in case you ever want to reinstall it. This college Office 365 is only valid while you are a student at MATC. Microsoft does not have versions of Access or Publisher for MAC. You can use your virtual desktop if you need those applications. Step by Step Guide - You may see some different options depending on your MAC OS. Click Office 365 - the link at the upper left of your screen. Click Install Now and follow the on screen instructions. OR ​Select the gear icon next to your name in the upper right hand corner of the screen. Under My app settings, select Office 365. OR New Outlook option Feb 2019: click the Office apps icon (9 squares) in the upper left corner, then choose Office 365. If prompted, select Software and then Office. Select Install and an installer (.dmg) file will now be downloaded to your Mac. When the download completes, launch the installer by selecting the office installer icon (or you can open the .dmg file that was just downloaded). The installer will guide you through a series of steps, select Continue and Agree and then Install to move through the install process. To activate Office so you can use the programs, select one of the applications from your Applications. A welcome screen appears. Select Sign in to an existing Office 365 subscription. Select Organizational account if you get a screen with that option - Important! Be sure to enter your Madison College email address (username@madisoncollege.edu) and your college password when asked to login or sign in to activate Office. Then select Next or Sign In. Select Yes when prompted if you would like to keep Office for Mac up to date. Choose Yes or No when asked whether you'd like to join the Customer Experience Improvement Program. You're now ready to use Office. If you are no longer using Office 365 on a particular computer, you can deactivate an installation. You can also check your installations. Log in using your college username and password. From the Install status tile, select Manage installs. Use your Madison College account password. Using a compatible Chromebook, you may now be able to add some Microsoft Office Apps from the Google Play Store - such as Word. Sign into the app with your Madison College email address (username@madisoncollege.edu). These are apps - not the "full" Microsoft software. For some courses, you may be able to use Google Chromebook apps (such as Google Docs), online apps, or Microsoft apps to view files from your instructor or work on assignments such as papers, presentations or spreadsheets. Be sure to follow your assignment instructions. Save as an acceptable format following your assignment instructions. You may need to download or save the file to a storage location before adding as an attachment in email or uploading to Blackboard. Chromebook apps are not the "full" Microsoft WIndows software - so you cannot use the Chromebook apps for a business software course at MATC. For example, our Microsoft Word courses require the full software package on a Windows platform. Workaround: use the virtual desktops on a Chromebook (or MAC) to access Microsoft software Windows versions - choose quick browser / VMware Horizon HTML Access. If you previously used a version of Microsoft Office, even a trial version, or use another Microsoft account, you may need to sign out of that account before signing in with your new Madison College account. The license for your subscription is tied to your college email. Offline Access - You can use the software offline. However, you must connect to the Internet once every 30 days to verify you are still eligible for the program. Access after graduation or when no longer enrolled - When you graduate or are not taking classes, your Office 365 subscription will end and you will no longer be able to use the software for free. You will not be able to edit files, but should still be able to view your locally saved files. You could choose to purchase a consumer version. Existing Purchases or Subscriptions - If you purchased or subscribed to a version of Microsoft Office, you can continue to use that instead. Students are not required to install or use the Microsoft Student Advantage program. Refunds or reimbursements are not available. Microsoft Office 365 Student Advantage and its license is only valid while you are a student at MATC.